The Bullet Tools I-20 20" Tile Flooring Cutter will make a clean cut. 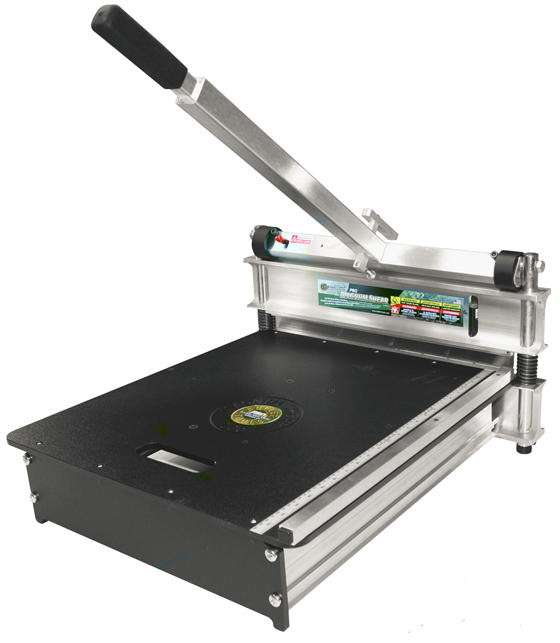 The I-20 offers the versatility you need to cut a wide variety of products up to 20" wide and 1" thick. It is sure to cut through laminate, engineered wood flooring, siding, roofing and vinyl. For the users' protection it has an easy-to-use safety lock. For ease of use it has a removable fence, which sets at 45° & 90° angles. In addition, there is also an extension handle for extra leverage. Cutting Width: up to 20"
Cutting Depth: up to 1"